CUD has given me so much in many ways and, above all, a good education. I selected CUD because they have given me the opportunity to study my course of choice as well as other interesting majors. One more thing I love about CUD is that it is multi-cultural; we have different nationalities that interact with one another and share their experiences. I intend to go back to Somalia and work on improving the environmental and health situation there. It is a pleasure to be an Engineering student at CUD for the resources it provides. CUD’s Telecommunications program provides state of the art equipment for hands on experience in the labs, which helps the students understand the theoretical concepts through experimentation. Another benefit is that CUD students are given the opportunity to interact directly with their professors, which is an asset many students around the world don’t have. The reason I chose e-business as a major was because I see it as the way of the future; it is a growing industry that will require more and more professionals as it develops in the Gulf region. Canadian University Dubai allows me to be part of a unique community that opens doors of opportunity to Canadian education. My professors come from very professional and diverse backgrounds and were able to relate course material to the real world. 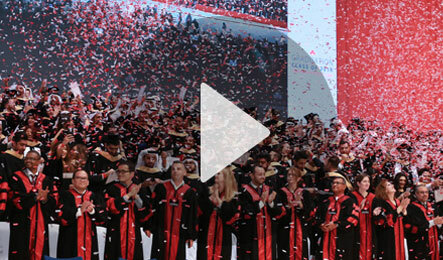 It is safe to say that Canadian University Dubai sets the standard for Canadian Education in the Middle East. The appeal of the Health Organization Management degree is that it combines both business-related and health-related subjects in one program, providing a good grounding in the operational and management considerations of running a business, while bringing in the science of healthcare-based systems. This, combined with the experience of the professors, make for a very interesting blend of courses that offer different insights into hospitals and medical facilities management from a corporate perspective. The program has a highly vocational focus and I can already see that there will be many different career options open to me when I graduate. I transferred from the University of British Columbia in Canada to CUD, and was obviously drawn by the Canadian connection. I found the University to have a strong focus on learning outcomes, much like the Canadian system, which is what drives you to develop as a real professional during the course of your academic studies. The professors have constantly challenged us, not only to push ourselves in class, but also to take part in competitions and other opportunities that expose us to the professional design world. Alongside this rewarding academic experience, CUD also offers a wide range of opportunities for an exciting student life. I chose the International Business program because it provides an all-round view of the business world, including finance, marketing, supply chains and so on, and is in-demand among employers operating to international business administration standards. The study plan at CUD is well constructed, combining practical learning with the introduction of new concepts. The professors are highly qualified, always eager to help at any time, and their teaching methods are both professional and engaging. The University’s culturally diverse student and academic community provide a real opportunity for global exposure, which will be important for a future in international business. Accounting was one of my favorite subjects from the very beginning, which is why I chose this particular stream. The variety of courses that were offered at Canadian University Dubai gave me a complete overview of the industry even before I entered the professional world. In addition to that, these courses have also prepared me for CFA exams, which I intend to pursue after completing my bachelors. I truly believe a degree from an institution like Canadian University Dubai will add value to my resume and help me kick start my career. Over the years I have played for the University Volleyball Team, which helped me improve my athletic skills and I had the chance to meet a lot of talented players from other universities. I would recommend this University to any one that’s looking for a perfect balance between academics and extra-curricular activities. I chose Environmental Health Management because I have always wanted to make a difference in the world and help people in a unique way. As part of my degree, I had the chance to learn from some of the most qualified professors in the field and worked closely with students from different backgrounds and nationalities. I’d like to own my own business one day; one that emphasizes the importance of recycling and educates the community on the importance of waste management. I came from Nigeria to study at Canadian University Dubai and it has been a truly amazing experience, from which I have grown both personally and professionally. The curriculum is very well structured, right from year one when we get the opportunity to meet students from other majors across the University during the general education programs, through the second and third years, where we are given a step-by-step introduction to the skills and techniques required for professional practice, culminating in the fourth and fifth years when we are presented withreal-world design challenges, through both academic activities and industry-based internship. The School also regularly organizes extra-curricular events and competitions that allow us to develop our broader skills in a fun, informal environment. As a student at CUD the opportunities are endless. At CUD they deliver an applications-based approach to education, which is very critical to me to ensure the all-round development in the program. The faculty are all professionals in the field who have a very interactive approach to teaching. The program has brought out the best in me and I am glad that CUD has given me the perfect platform to achieve my goals. I currently work for DP world as a manager in HR recruitment. The program I have chosen is excellent and the faculty members have immense knowledge. They assist me whenever I need help in terms of gaining further knowledge, providing extra classes or spending one-to-one time for deeper learning. The flexible study options at CUD ensure that I am able to find a good balance between work and study. The facilities here are very good, the class rooms are well equipped and the location of the University is excellent and very accessible. I love CUD and I am planning on doing my MBA here in the future. As a computer engineering graduate, I chose the MBA program in Finance to expand my understanding of the business world and to open new opportunities for me in my professional career. I have found the program to be very informative and with their varying backgrounds in economics, finance, operations management and other fields, each member of faculty has brought a fresh perspective to the classroom. The program has given me a new outlook on the business world, and I now feel more capable and well-versed in business terminology, and able to work better with teams and contribute to their discussions. This has also been observed by my employer as more responsibilities have been delegated to me, especially in managing technical projects. Running my own organization, I realized that any competitive business requires an advanced and proficient technology platform. Having researched several institutions offering Masters qualifications in IT, I concluded that the MITGOV at CUD would provide me with the right blend of technical and professional skills to be able to anticipate and implement the specific needs of my business, and ultimately save time and resources. The professors on the program are extremely knowledgeable and I am constantly learning from them. The University environment is very friendly and I have really benefitted from meeting students from different personal and professional backgrounds. I wanted to combine my love of science and communication in my higher education, which led me to the Telecommunication Engineering degree. As a Canadian citizen based in the Middle East, Canadian University Dubai was the perfect choice for me. The faculty members here are extremely helpful and proactive in bringing real life into the classroom through applied projects and industry guest lectures. Outside of the classroom, there are always opportunities to learn new things, whether by taking part in competitions, or through course-related internships. I have also enjoyed contributing to the university in other ways, as a member of the Student Council and a volunteer for various events and activities, which has helped improve my employability and enhanced my overall university experience. My degree means a lot more than its physical value. In addition to gaining comprehensive knowledge, I learnt different techniques in problem solving. It truly gave me the opportunity to expand my knowledge and shape the way I deal with real life situations. I would recommend CUD to anyone who is looking for a university with world class professors and a richly diverse student body.